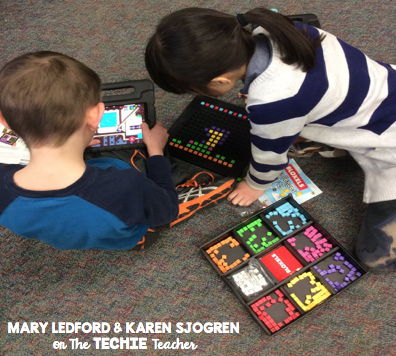 Bloxels: Game-Based Learning at Its Best | The Techie Teacher® . 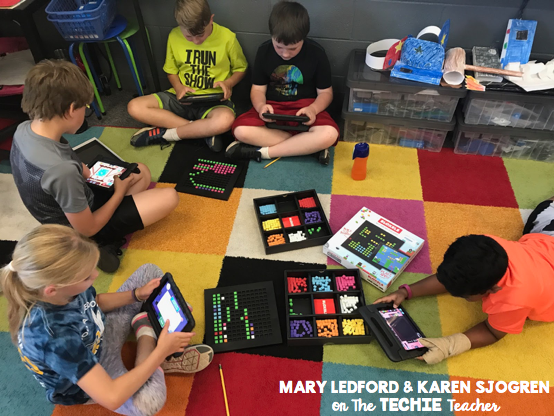 We first discovered Bloxels at FETC 2017 in Orlando, Florida at a poster session called “Top Tech Toys to Transform Your Classroom.” Before the session even ended, we were at the vendor booth checking Bloxels out for ourselves. We had to wait for a while to even get close to the table, it was just that popular! So if you are new to the Bloxels world, welcome! Bloxels is a platform that allows students to create their own video games without any coding knowledge. All you need is your imagination! Using the Bloxel board and blocks, students create game layouts, pixel art, backgrounds and characters. A handy guide is included in each kit to guide you and give advice for each step. When you are happy with your creation, snap a picture using the built in camera feature to bring your creations to life and begin playing. Once you feel comfortable you can begin to edit your game and animate your characters, add villains, or text features. Don’t have the board or blocks yet? Try starting by downloading the app for iPads or Androids. The app allows you to design settings, characters and more with the swipe of a finger. The game board includes manipulatives which are great for developing dexterity and fine motor skills. Ready to grab some for your classroom? Amazon has them on sale for a limited time! Click the affiliate link below to grab a set. Watch video tutorials on how to build and play your own game, click here. The Bloxels designers have worked really hard to make this user friendly. So many times, we find an educational “toy” that we get excited about but struggle on how to make it fit into the already packed curriculum. We’re happy to report, this wasn’t the case! We found so many ways to integrate Bloxels with the mandated curriculum. Every February, our students engage in a writing unit called “Writing Gripping Fictional Stories.” At the end of the unit, we usually have a publishing party where we share our stories with fellow authors and celebrate our hard work. This year, we decided we would not take our drafts to the final “pen and paper” copy, but publish in a different way; author’s choice! 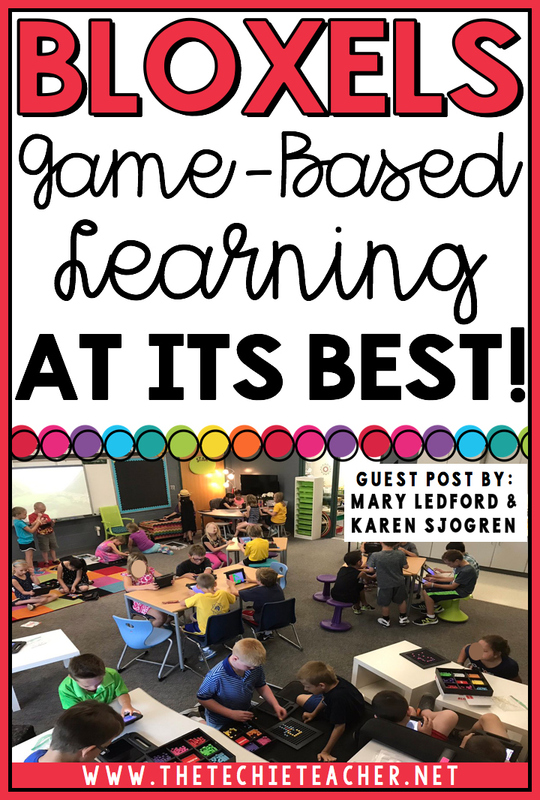 Students were allowed to choose from sharing their writing on a classroom site for families to see, creating a video or making a video game that tells their story. The idea was a huge hit! Students re-created their character, setting, problem or goal from their story by using the Bloxel app and a graphic organizer to create a game that also told their story. Our second grade science unit, Life Cycle of Plants, was the perfect place to implement an idea from the Bloxel Education site. Students designed a video game where the seed must travel through all of the parts of the plant. Text boxes (white blocks) made it easy for students to share vocabulary and define plant parts as their seed traveled. To differentiate for higher students, they had to bring in weather elements that may affect a plant’s growth as the seed traveled. They were considered the seed’s “enemy” with weeds being a “walker enemy”, rain and wind being a “flyer” and a scorching sun shooting fireballs was the “sentry enemy”. In 3rd grade, our students create an original fairy tale as a part of our final narrative unit of study. After developing their characters, setting, motivations and story ideas on paper, the students designed a video game to really bring their story to life working in all of their story elements. The white story blocks in Bloxels gave them the chance to incorporate their writing directly into the game. Modeling their settings using the terrain blocks was another way to add visual elements to their game. And needless to say, designing their characters and villains was very exciting. After creating their games, the students formulated directions on how to play the game. They had to think of questions, pitfalls and hurdles that their players might have. This gave them the opportunity to display their higher level thinking skills. If you are looking at ways to incorporate the 4 Cs, Bloxels has it all. This upcoming school year, we hope to have students design a geometry game, where students are trying to collect specific geometric shapes, such as The Quadrilateral Collection or Polygon Packages. Oh and our state history. We can’t wait to have our students gamify our Michigan history as players venture back into time. The possibilities are endless! For more ideas of how to make Bloxels a part of your classroom click here. Do you have an idea? Please share in the comment section! We are always looking for more ideas! Mary Ledford is currently a 2nd grade teacher with over 18 years of experience in various grade levels. As an Apple educator, she strives to help other educators feel comfortable with bringing technology into the classroom. Karen Sjogren is currently a 3rd grade teacher who has worked in education on and off for the past 18 years. Prior to coming to education, she was a public relations consultant and a self-taught graphic designer. This dynamic duo can be found teaching at Saline Area Schools, leading PD for educators or behind a great cup of coffee! You can connect with them on Twitter @ksjogie @SuperStars2ndGr.